When Simbegwire’s mother died, she was very sad. Simbegwire’s father did his best to take care of his daughter. Slowly, they learned to feel happy again, without Simbegwire’s mother. Every morning they sat and talked about the day ahead. Every evening they made dinner together. 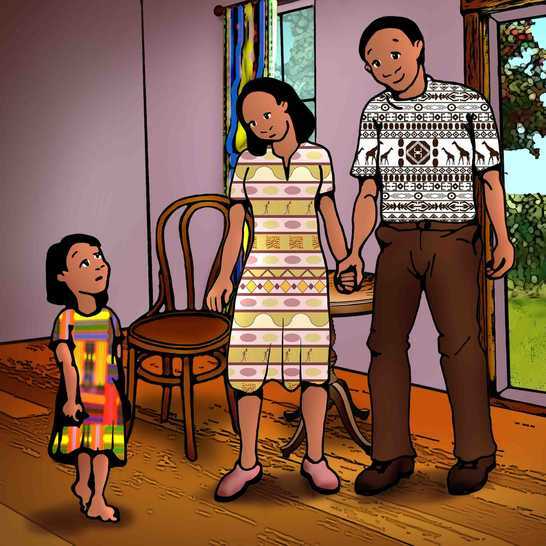 After they washed the dishes, Simbegwire’s father helped her with homework. When Simbegwire's mother died, she was very sad. Simbegwire's father did his best to take care of his daughter. Slowly, they learned to feel happy again, without Simbegwire's mother. Every morning they sat and talked about the day ahead. Every evening they made dinner together. 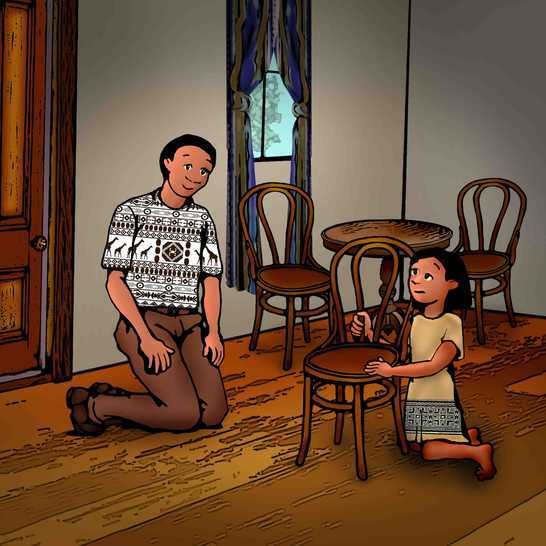 After they washed the dishes, Simbegwire's father helped her with homework. Quand la mère de Simbegwire décéda, Simbegwire fut très triste. Son père essaya de son mieux de prendre soin de sa fille. Lentement, ils apprirent comment se sentir heureux de nouveau, sans la mère de Simbegwire. Chaque matin, ils s'assoyaient et discutaient de la journée à venir. Chaque soir, ils cuisinaient le souper ensemble. Après avoir lavé la vaisselle, le père de Simbegwire l'aidait avec ses devoirs. One day, Simbegwire’s father came home later than usual. “Where are you my child?” he called. Simbegwire ran to her father. She stopped still when she saw that he was holding a woman’s hand. “I want you to meet someone special, my child. This is Anita,” he said smiling. One day, Simbegwire's father came home later than usual. "Where are you my child?" he called. Simbegwire ran to her father. She stopped still when she saw that he was holding a woman's hand. "I want you to meet someone special, my child. This is Anita," he said smiling. Un jour, le père de Simbegwire retourna chez eux plus tard que d'habitude. « Où es-tu mon enfant ? » il demanda. Simbegwire se précipita vers son père. Elle s'arrêta en chemin quand elle vit qu'il tenait la main d'une femme. « Je veux te présenter quelqu'un de spécial, mon enfant. Voici Anita, » il dit en souriant. “Hello Simbegwire, your father told me a lot about you,” said Anita. But she did not smile or take the girl’s hand. Simbegwire’s father was happy and excited. He talked about the three of them living together, and how good their life would be. “My child, I hope you will accept Anita as your mother,” he said. "Hello Simbegwire, your father told me a lot about you," said Anita. But she did not smile or take the girl's hand. Simbegwire's father was happy and excited. He talked about the three of them living together, and how good their life would be. "My child, I hope you will accept Anita as your mother," he said. « Bonjour Simbegwire, ton père m'a beaucoup parlé de toi, » dit Anita. Mais elle ne sourit pas et ne serra pas la main de la fille. Le père de Simbegwire était content et excité. Il dit que les trois vivraient ensemble et qu'ils auraient une bonne vie. « Mon enfant, j'espère que tu accepteras Anita comme ta mère, » il dit. Simbegwire’s life changed. She no longer had time to sit with her father in the mornings. 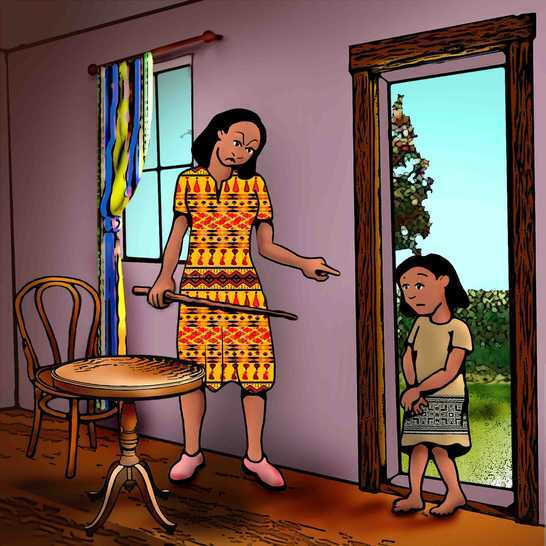 Anita gave her so many household chores that she was too tired to do her school work in the evenings. She went straight to bed after dinner. Her only comfort was the colourful blanket her mother gave her. Simbegwire’s father did not seem to notice that his daughter was unhappy. Simbegwire's life changed. She no longer had time to sit with her father in the mornings. Anita gave her so many household chores that she was too tired to do her school work in the evenings. She went straight to bed after dinner. Her only comfort was the colourful blanket her mother gave her. Simbegwire's father did not seem to notice that his daughter was unhappy. La vie de Simbegwire changea. Elle n'avait plus le temps de s'asseoir avec son père le matin. Anita lui donnait tellement de tâches ménagères qu'elle était trop fatiguée pour faire ses devoirs le soir. Elle allait directement se coucher après le souper. Son seul confort était la couverture colorée que sa mère lui avait faite. Le père de Simbegwire ne semblait pas remarquer que sa fille était malheureuse. After a few months, Simbegwire’s father told them that he would be away from home for a while. “I have to travel for my job,” he said. “But I know you will look after each other.” Simbegwire’s face fell, but her father did not notice. Anita did not say anything. She was not happy either. After a few months, Simbegwire's father told them that he would be away from home for a while. "I have to travel for my job," he said. "But I know you will look after each other." Simbegwire's face fell, but her father did not notice. Anita did not say anything. She was not happy either. Après quelques mois, le père de Simbegwire annonça qu'il serait parti pour un certain temps. « Je dois voyager pour mon travail, » dit-il. « Mais je sais que vous allez vous occuper l'une de l'autre. » Le visage de Simbegwire s'allongea, mais son père ne remarqua pas. Anita ne dit rien. Elle n'était pas contente non plus. Things got worse for Simbegwire. If she didn’t finish her chores, or she complained, Anita hit her. And at dinner, the woman ate most of the food, leaving Simbegwire with only a few scraps. Each night Simbegwire cried herself to sleep, hugging her mother’s blanket. Things got worse for Simbegwire. If she didn't finish her chores, or she complained, Anita hit her. And at dinner, the woman ate most of the food, leaving Simbegwire with only a few scraps. 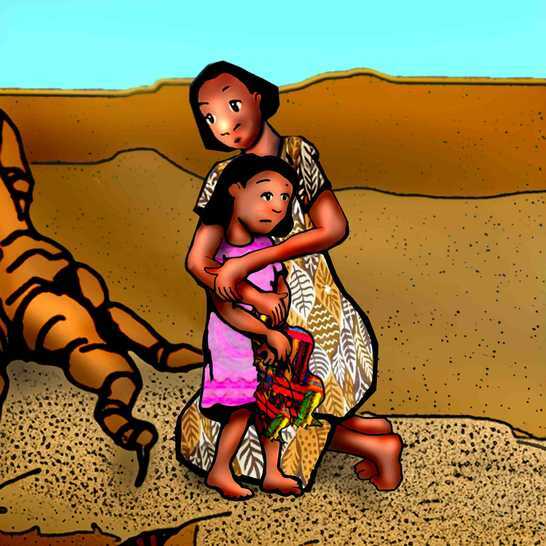 Each night Simbegwire cried herself to sleep, hugging her mother's blanket. Les choses empirèrent pour Simbegwire. Si elle ne terminait pas ses tâches, ou si elle se plaignait, Anita la frappait. Et pendant le souper, la femme mangeait la plupart de la nourriture, laissant Simbegwire avec peu de restes. Chaque nuit Simbegwire s'endormait en pleurant, embrassant la couverture de sa mère. One morning, Simbegwire was late getting out of bed. “You lazy girl!” Anita shouted. She pulled Simbegwire out of bed. The precious blanket caught on a nail, and tore in two. One morning, Simbegwire was late getting out of bed. "You lazy girl!" Anita shouted. She pulled Simbegwire out of bed. The precious blanket caught on a nail, and tore in two. Un matin, Simbegwire se leva en retard. « Paresseuse ! » cria Anita. Elle tira Simbegwire de son lit. La couverture précieuse resta accrochée sur un clou et déchira en deux. Simbegwire was very upset. She decided to run away from home. She took the pieces of her mother’s blanket, packed some food, and left the house. She followed the road her father had taken. Simbegwire was very upset. She decided to run away from home. She took the pieces of her mother's blanket, packed some food, and left the house. She followed the road her father had taken. Simbegwire était très bouleversée. Elle décida de se sauver de chez elle. Elle prit les morceaux de couverture de sa mère, emporta de la nourriture et quitta la maison. Elle suivit le chemin que son père avait pris. 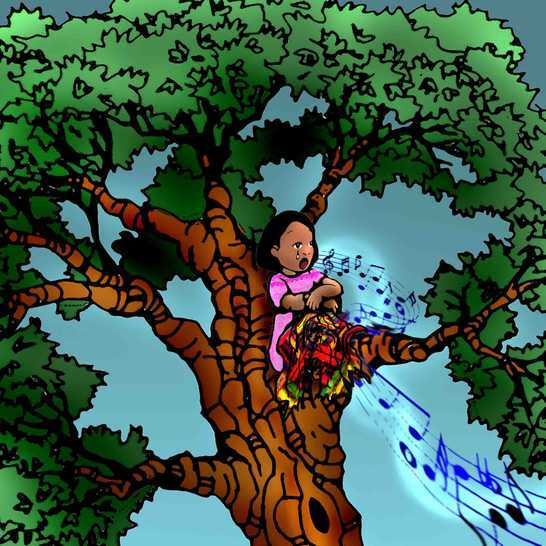 When it came to evening, she climbed a tall tree near a stream and made a bed for herself in the branches. As she went to sleep, she sang: "Maama, maama, maama, you left me. You left me and never came back. Father doesn't love me anymore. Mother, when are you coming back? You left me." The next morning, Simbegwire sang the song again. 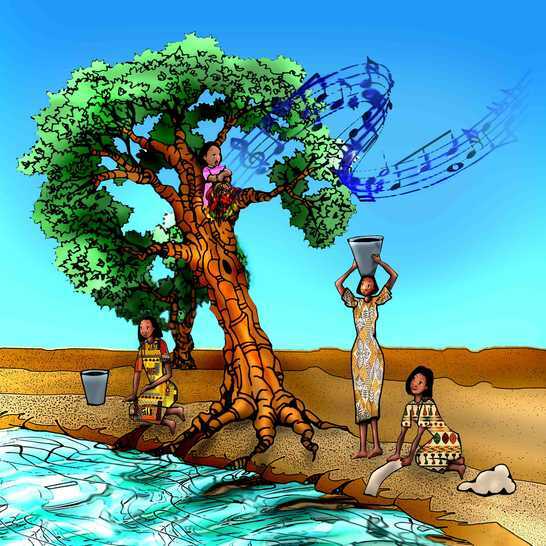 When the women came to wash their clothes at the stream, they heard the sad song coming from the tall tree. They thought it was only the wind rustling the leaves, and carried on with their work. But one of the women listened very carefully to the song. Le lendemain matin, Simbegwire chanta encore la chanson. Quand les femmes arrivèrent au ruisseau pour laver leur linge, elles entendirent la chanson triste qui venait du grand arbre. Elles pensaient que c'était seulement le bruissement des feuilles et continuèrent leur travail. Mais une des femmes écouta la chanson attentivement. This woman looked up into the tree. 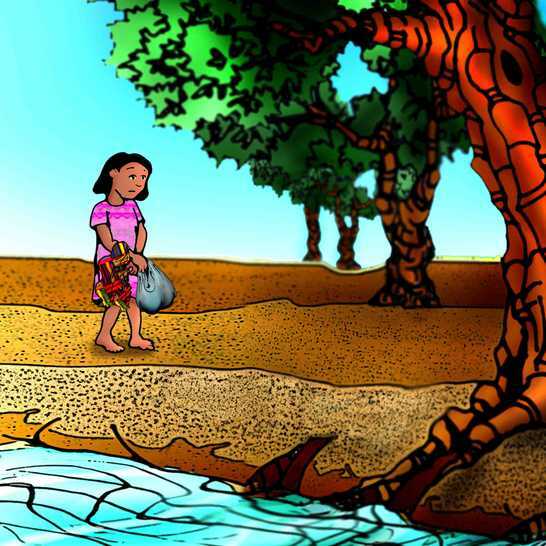 When she saw the girl and the pieces of colourful blanket, she cried, “Simbegwire, my brother’s child!” The other women stopped washing and helped Simbegwire to climb down from the tree. Her aunt hugged the little girl and tried to comfort her. This woman looked up into the tree. 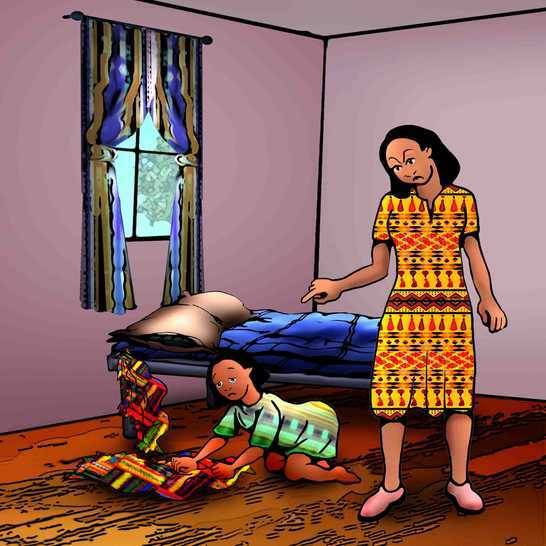 When she saw the girl and the pieces of colourful blanket, she cried, "Simbegwire, my brother's child!" The other women stopped washing and helped Simbegwire to climb down from the tree. Her aunt hugged the little girl and tried to comfort her. Cette femme jeta un coup d'œil dans l'arbre. Quand elle vit la fille et les morceaux de couverture colorés, elle cria, « Simbegwire, l'enfant de mon frère ! » Les autres femmes arrêtèrent de laver et aidèrent Simbegwire à descendre de l'arbre. Sa tante l'embrassa et essaya de la réconforter. Simbegwire’s aunt took the child to her own house. She gave Simbegwire warm food, and tucked her in bed with her mother’s blanket. That night, Simbegwire cried as she went to sleep. But they were tears of relief. She knew her aunt would look after her. Simbegwire's aunt took the child to her own house. 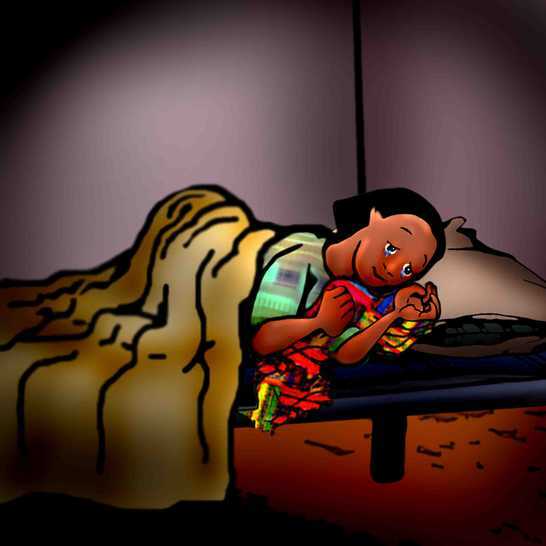 She gave Simbegwire warm food, and tucked her in bed with her mother's blanket. That night, Simbegwire cried as she went to sleep. But they were tears of relief. She knew her aunt would look after her. La tante de Simbegwire la mena chez elle. Elle donna à Simbegwire un repas chaud et la borda dans son lit avec la couverture de sa mère. Ce soir-là, Simbegwire s'endormit en pleurant. Mais ses larmes étaient des larmes de joie. Elle savait que sa tante prendrait soin d'elle. 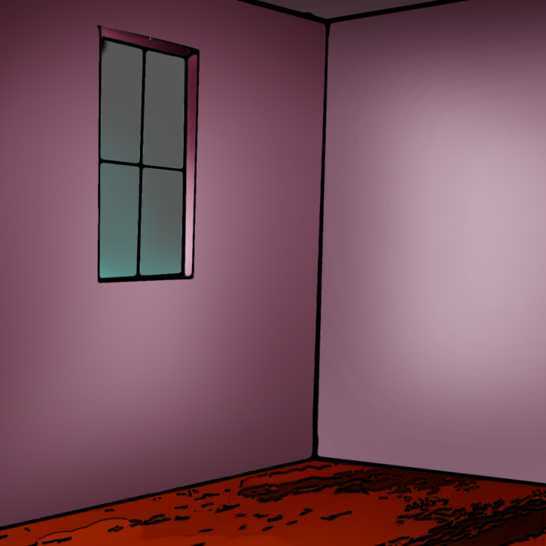 When Simbegwire’s father returned home, he found her room empty. “What happened, Anita?” he asked with a heavy heart. The woman explained that Simbegwire had run away. “I wanted her to respect me,” she said. “But perhaps I was too strict.” Simbegwire’s father left the house and went in the direction of the stream. He continued to his sister’s village to find out if she had seen Simbegwire. 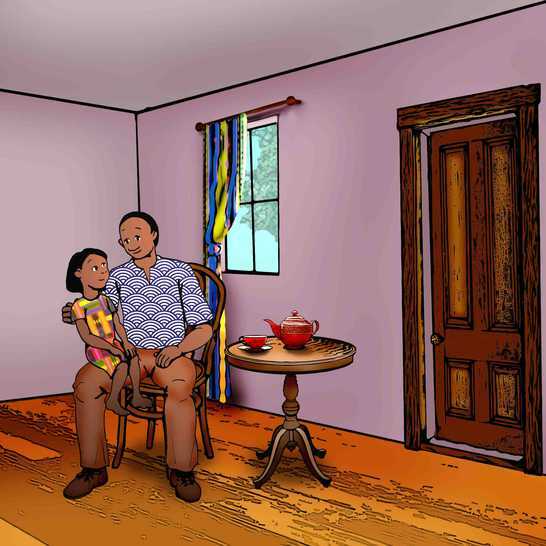 When Simbegwire's father returned home, he found her room empty. "What happened, Anita?" he asked with a heavy heart. The woman explained that Simbegwire had run away. "I wanted her to respect me," she said. "But perhaps I was too strict." Simbegwire's father left the house and went in the direction of the stream. He continued to his sister's village to find out if she had seen Simbegwire. Quand le père de Simbegwire rentra chez lui, il trouva la chambre de sa fille vide. « Qu'est-ce qui est arrivé, Anita ? » il demanda, le cœur gros. La femme expliqua que Simbegwire s'était sauvée. « Je voulais qu'elle me respecte, » dit-elle. « Mais j'ai peut-être été trop sévère. » Le père de Simbegwire quitta la maison et se dirigea dans la direction du ruisseau. Il se rendit au village de sa sœur pour découvrir si elle avait vu Simbegwire. Simbegwire was playing with her cousins when she saw her father from far away. She was scared he might be angry, so she ran inside the house to hide. But her father went to her and said, “Simbegwire, you have found a perfect mother for yourself. One who loves you and understands you. I am proud of you and I love you.” They agreed that Simbegwire would stay with her aunt as long as she wanted to. Simbegwire was playing with her cousins when she saw her father from far away. She was scared he might be angry, so she ran inside the house to hide. 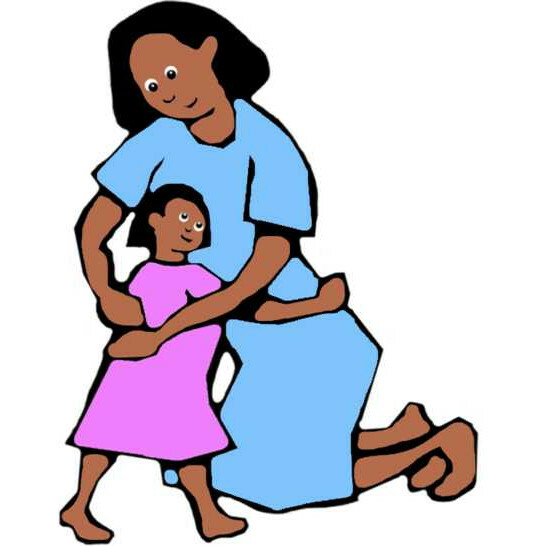 But her father went to her and said, "Simbegwire, you have found a perfect mother for yourself. One who loves you and understands you. I am proud of you and I love you." They agreed that Simbegwire would stay with her aunt as long as she wanted to. Simbegwire jouait avec ses cousins quand elle vit son père de loin. Elle avait peur qu'il soit peut-être fâché, alors elle se précipita à l'intérieur de la maison pour se cacher. Mais son père vint la voir et lui dit, « Simbegwire, tu t'es trouvé une mère parfaite. Une mère qui t'aime et te comprends. Je suis fier de toi et je t'aime. » Ils se mirent d'accord que Simbegwire resterais avec sa tante aussi longtemps qu'elle veuille. Her father visited her every day. Eventually, he came with Anita. She reached out for Simbegwire’s hand. “I’m so sorry little one, I was wrong,” she cried. “Will you let me try again?” Simbegwire looked at her father and his worried face. Then she stepped forward slowly and put her arms around Anita. Her father visited her every day. Eventually, he came with Anita. She reached out for Simbegwire's hand. "I'm so sorry little one, I was wrong," she cried. "Will you let me try again?" Simbegwire looked at her father and his worried face. Then she stepped forward slowly and put her arms around Anita. Son père lui rendit visite à chaque jour. Finalement, il vint avec Anita. Elle tendit la main vers celle de Simbegwire. « Je suis tellement désolée, petite, j'ai eu tords, » elle cria. « Me laisseras-tu essayer de nouveau ? » Simbegwire examina son père et son regard inquiet. Puis elle fit lentement un pas en avant et mit ses bras autour d'Anita. 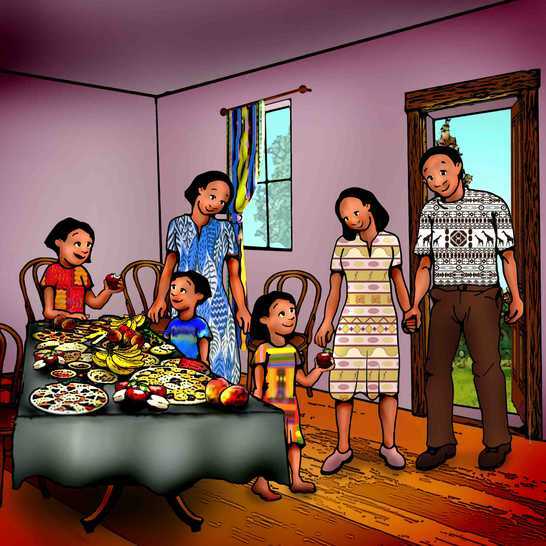 The next week, Anita invited Simbegwire, with her cousins and aunt, to the house for a meal. What a feast! Anita prepared all of Simbegwire’s favourite foods, and everyone ate until they were full. Then the children played while the adults talked. Simbegwire felt happy and brave. 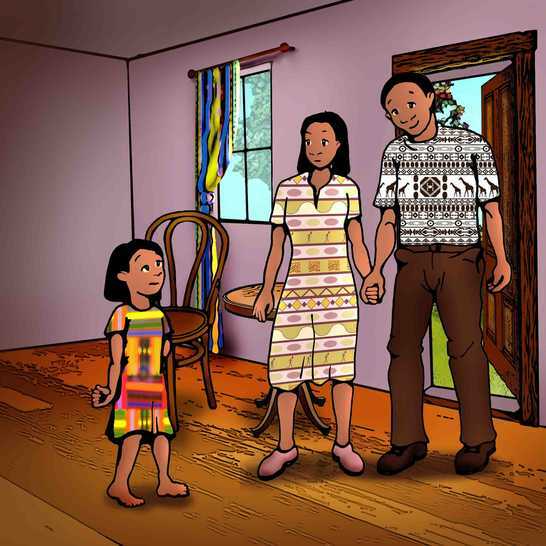 She decided that soon, very soon, she would return home to live with her father and her stepmother. 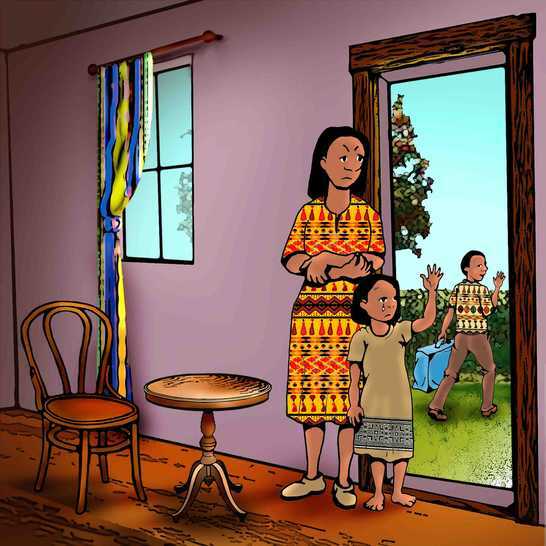 The next week, Anita invited Simbegwire, with her cousins and aunt, to the house for a meal. What a feast! Anita prepared all of Simbegwire's favourite foods, and everyone ate until they were full. Then the children played while the adults talked. Simbegwire felt happy and brave. She decided that soon, very soon, she would return home to live with her father and her stepmother. La semaine suivante, Anita invita Simbegwire, ainsi que ses cousins et sa tante, chez elle pour un repas. Quel festin ! Anita prépara tous les plats favoris de Simbegwire et tous mangèrent jusqu'à temps qu'ils soient pleins. Ensuite, les enfants jouèrent tandis que les adultes parlaient. Simbegwire se sentait contente et courageuse. Elle décida que bientôt, très bientôt, elle retournerait chez elle pour vivre avec son père et sa belle-mère.